Here we get some insight into a prevalent, confusing, and frustrating, aspect of the college experience: the fact that nobody knows what they will pay for any given school. While schools will publish tuition rates and total costs, if you pull ten random students from any random college (particularly the private ones) to ask what they actually pay you’ll end up with ten different answers. 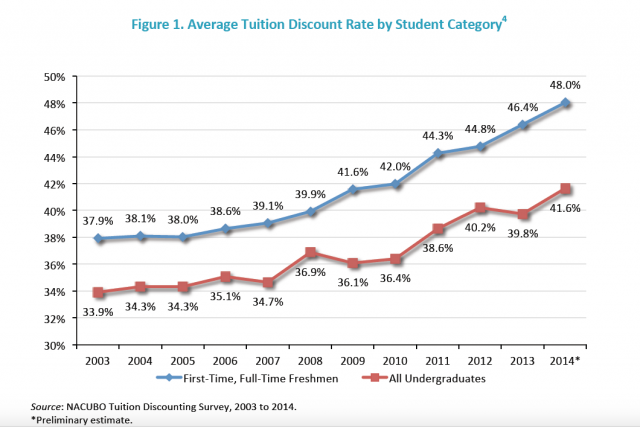 As an article and accompanying chart by Kellie Woodhouse of Inside Higher Ed show, the average tuition discount now runs a full 48% for incoming freshmen and 41.6% overall. 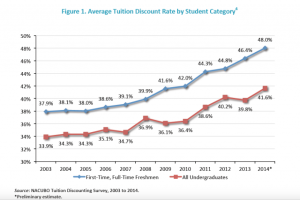 The article also states that a full 77% of current students currently receive a discount. In other words, we’re approaching the point where three-quarters of students pay an average of nearly half of the published tuition at their schools. Why is this done? Why does the actual price paid differ so widely from the published price? The answer is twofold: 1) the higher published price allows colleges to charge more whenever they can get away with it and 2) discounts act as a discriminatory admissions tool. The college might only “need” to charge $25,000 per student, but if it has a certain number of students able to pay a higher tuition then they feel that to “only” charge that amount leaves money on the table. Also, as a college seeks to round out its student body with students of a certain variety (admissions counselors seek to engineer their demographic diversity along economic, racial, geographic, study area, and other lines) it will offer discounts to entice desired students to join the mix. The second of these reasons engenders much controversy. After all, if a landlord posted rent at $X but put out the word that he would take half that amount from tenants of a certain “desirable” variety he would soon be sued for discrimination. But in the world of college this practice has become very much the norm. Right or wrong, it is what it is. That said, this understanding should shift the behavior of those prospective students looking to get a good deal. For one, it literally pays to go where you’re wanted, as we’ve explored previously. For two, I always encourage students to explore schools primarily for other reasons beyond price, given the wide prevalence of discounting. In short, don’t rule out schools that seem out of reach if they’re an otherwise good fit (We’ll discuss this idea further in our next Tip of the Week). In the meantime, be discouraged enough by tuition increases to take action to alleviate the pain, but encouraged that not all is at it seems on that front.